My SolarEdge system is not updating? By far the most common issue we’re contacted about with Solar Edge systems is the lack of communication with the internet. 9 times out of 10 this is because the internet router has been changed and the new wifi password needs to be set in the SolarEdge inverter. So we thought this guide would be helpful to get you back in touch with your monitoring portal so you can have confidence everything is working well. Keeping your Solar Edge inverter system online also increases your warranty benefit and will ensure that alerts are emailed to Naked Solar should a fault occur. This speeds up the fault diagnosis and rectification process, getting you back up and generating ASAP. There are two versions of the SolarEdge inverters, the HD wave and the older SE models. Here are the instructions for each type, ensure you pick the one you have. Turn the inverter OFF using the ON/OFF switch on the bottom of the inverter (the inverter screen will tell you when it’s safe to continue). 1. Press the OK button once to light the screen. 2. Hold the OK Button for 5 seconds, then release to enter menu. 3. “Please enter password message” will be displayed (this is asking for the password to enter the inverter menu not your wifi password yet). 12. Turn the inverter back on. 13. Check your Solar Edge monitoring portal. Any historical data that is stored in the inverter will upload typically within an hour. 1. Verify that the inverter ON/OFF switch is OFF. 3. Scroll down to the Communication submenu and select it. (Some of the menu items may vary depending on device and configuration). 4. Select the Server submenu, scroll down to the Wi-Fi option and select it. 5. Scroll down to the Wi-Fi Conf submenu and select it. 6. Select WPS mode. The status message ‘Waiting’ is displayed. 7. On your wireless router, locate the WPS button. Push and hold it down until a LED lights up (refer to your router manual). 8. 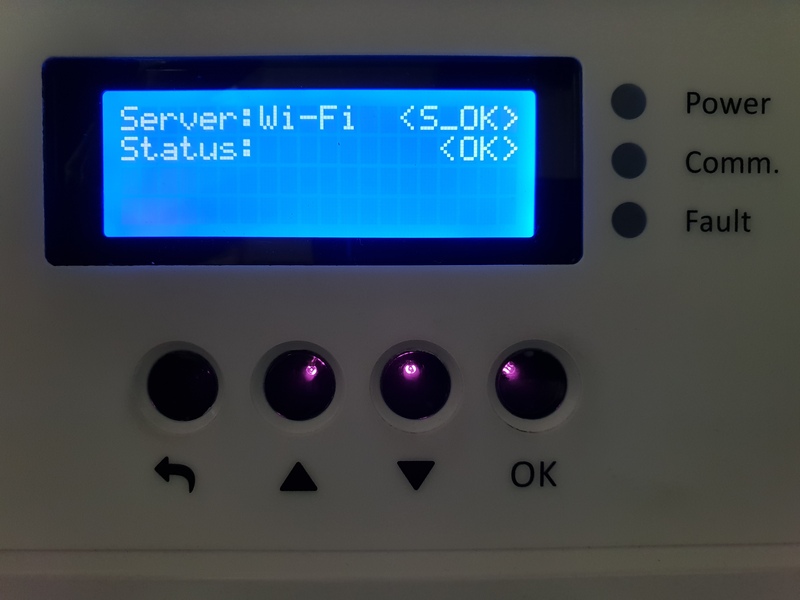 On the inverter LCD, check that the message has changed to Connected. 9. Exit the Setup mode by pressing the Esc button in each submenu screen or wait for the device to exit Setup mode automatically, if no buttons are pressed for more than two minutes. 10. Check your Solar Edge monitoring portal. Any historical data that is stored in the inverter will upload typically within an hour.